Conflict in Ukraine led Iryna Dehtiarova to the 2017 Canadian School of Peacebuilding (CSOP). “The war started three years ago, and people have experienced so much trauma,” says Dehtiarova, who works as a project coordinator for health, education and now peace projects, with Mennonite Central Committee (MCC) in Zaporizhzhia, Ukraine. MCC’s response in the Ukraine began with humanitarian aid. Four years on, Dehtiarova and her colleagues have seen the need for psychological support, trauma healing, and peacebuilding. Some of Dehtiarova’s colleagues have studied at the CSOP over the years, so when her supervisors approached her about the possibility of coming herself, she was excited. Dehtiarova says the CSOP is giving her the practical tools she needs to help people in her home community. In her first week at the CSOP, she took Expressive Trauma Integration: Caregiving and Conflict Transformation with Dr. Odelya Gertel Kraybill, a leading trauma therapist, researcher, and consultant, with experience as a trainer with the UN in the Philippines, South Korea, China, and Japan. “It relates so well to my context,” says Dehtiarova, recalling a woman in her church who hid when the New Year’s fireworks went off. The noise and flashes of light triggered the trauma she had experienced in the conflict zone. 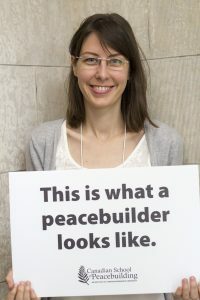 In her second week at the CSOP, she took Practices for Transforming the Peacebuilder, with Dr. Ron Kraybill, a peacebuilding consultant with over 30 years of experience, including most recently six years as Senior Advisor on Peacebuilding and Development for the UN in Lesotho and the Philippines.